RFID stands for Radio Frequency Identification. It is a technology that employs radio waves to read as well as capture data stored on a tag attached to an object(s) such as cloth items, electronic gadgets and more. It is possible to read tags from distances of several feet. The beauty is that the tag doesn’t require to be in the direct line-of-sight of the reader to be detected. A RFID system has 2 parts- a tag or label and a reader. A transmitter, as well as a receiver, is put inside RFID tags and labels. The latter has a microchip which processes as well as stores data. Secondly, there is an antenna which serves to transmit as well as receive signals. The tag has the specific serial number for a sole item. A 2-way radio transmitter-receiver referred to as reader/interrogator uses its antenna to emit a signal to the tag. The tag then sends the relevant data to the reader. Last the reader will dispatch the read results to RFID Deveices Guard Tour System. Passive and battery powered are the two varieties of RFID tags. The passive RFID tag will employ the reader’s radio wave energy to send its stored data back to the reader. On the other hand, there is a tiny battery inside the battery-powered RFID tag which supplies the necessary power to transmit data. 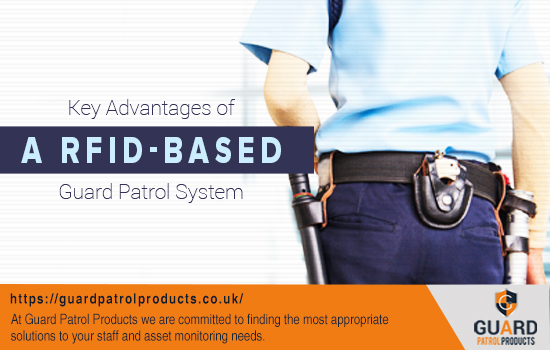 We look at the benefits of guard patrol system that uses RFID technology. The standard guard patrolling systems leverage Radio Frequency ID(RFID) tags as well as readers. Here RFID tags are put at checkpoints. The guards have to read those tags using an assigned RFID reader by an assigned time. Reports can be made at intervals and cross-checked with assigned routes as well as timings. The checkpoints identify and timestamp the guards’ IDs without human intervention as well as dispatch the information to the control unit. RFID tags are designed and manufactured to withstand wilful sabotages and can be read from relatively long distances. The former will work in wide temperature ranges. The tags are 100% waterproof. Additionally, they can be sealed within non-metallic material walls. There is no requirement of additional equipment. Only NFC (Near Field Communications) technology is employed to communicate with electronic gadgets, for instance, a smartphone. Thus, guard’s movement can be tracked as long as the former is carrying his/her phone. Note that in high-security scenarios guards may be barred from carrying personal gadgets. Alarms can be triggered immediately whenever some improper incident occurs. Examples are when a tour doesn’t happen, takes longer than stipulated time period, or when certain Security Guards checkpoints are skipped or missed. Alerts enable you to identify the causes and troubleshoot incidents instantly.